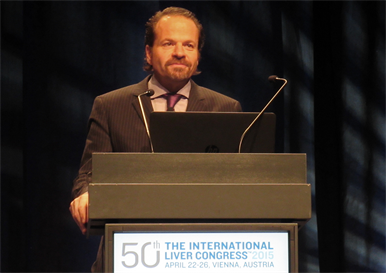 More than 70% of people with chronic genotype 1 hepatitis C who did not achieve a sustained virological response when treated with sofosbuvir/ledipasvir (Harvoni) for 8 or 12 weeks were cured with a subsequent 24-week course of the same two drugs, according to a study presented at the European Association for the Study of the Liver (EASL) International Liver Congress last week in Vienna, Austria. Direct-acting antiviral agents (DAAs) used in interferon-free regimens cure a large proportion of people with genotype 1 hepatitis C virus (HCV) infection, but the approach for the small percentage of people who are not cured is not yet established. Gilead Sciences’ nucleotide HCV NS5B polymerase inhibitor sofosbuvir plus NS5A inhibitor ledipasvir – the components of the Harvoni coformulation – was the first approved interferon-and ribavirin-free combination DAA regimen. In phase 3 trials, this regimen taken for 8 or 12 weeks cured more than 95% of nearly 2000 people, but a small percentage still had detectable HCV viral load at 12 weeks after the end of treatment. This study included a total of 41 participants from the ION, LONESTAR and TRIOLOGY 1 trials. Most had previously used sofosbuvir/ledipasvir with or without ribavirin, while eight had used sofosbuvir/ledipasvir plus the experimental non-nucleoside HCV polymerase inhibitor GS-9669. All participants in this open-label study were re-treated with 440mg sofosbuvir and 90mg ledipasvir in a once-daily coformulation, without ribavirin, for 24 weeks. The researchers evaluated sustained virological response, or continued undetectable HCV RNA at 12 week post-treatment (SVR12), and performed deep sequencing to look for virus with NS5A or NS5B resistance-associated variants (RAVs). More than 80% of participants were men, a quarter were African-American and the mean age was 58 years. Not surprisingly, given their prior treatment failure, they were a challenging population: more than 90% had unfavourable IL28B gene variants, 46% had liver cirrhosis (rising to 79% among those with NS5A resistance) and the mean baseline HCV RNA level was 6.2 log10 IU/ml. About three-quarters had been previously treated for 8 weeks and the rest for 12 weeks. Nearly two-thirds of those previously treated for 8 weeks and everyone treated for 12 weeks had baseline NS5A RAVs that potentially confer resistance to ledipasvir; the 11 people without these RAVs had all been treated for the shorter duration. HCV viral load declined rapidly after starting treatment and almost all participants had viral load <15 IU/ml by the end of treatment. One person experienced viral rebound while on treatment at week 16 and 11 relapsed, usually between the end of therapy and 4 weeks post-treatment. This resulted in an overall SVR12 rate of 71%. There was not much difference in response between people with and without cirrhosis (68% vs 74% respectively). However, prior treatment duration and presence of baseline NS5A resistance mutations were associated with greater likelihood of re-treatment failure. People initially treated for 8 rather than 12 weeks had a substantially higher SVR12 rate: 80% vs 46%, respectively. Baseline NS5A RAVs produced an even larger difference: 100% of those with and 60% of those without these RAVs achieved sustained response. People with a single RAV had a cure rate of 69%, falling to just 50% for those with two or more RAVs. Looking at specific NS5A RAVs, all participants with Q30R or M28T still achieved SVR12, but the cure rate fell to 80% for those with L31M and to only 33% for those with Y93H/N. With regard to NS5B RAVs that potentially confer resistance to sofosbuvir, no participants had these variants at baseline, but a third did when tested after virological failure: two with S282T, one with L159F and one with both mutations. As seen in prior studies of this regimen, treatment was generally safe and well-tolerated, with most adverse events being mild to moderate. Two participants had serious adverse events, neither of which were deemed related to the study drugs, and no one stopped treatment for this reason. The most common adverse events were headache (15%) and fatigue (10%). The key factors that minimise relapse are the depth of viral suppression and a patient’s individual immune response, Lawitz explained. Since we can’t change the latter, anything that improves the former should help achieve a cure, and we can improve viral suppression by either longer treatment or adding ribavirin.